I am contacted regularly by textile students asking for advice and information, so it seemed that there was a need for a course that would give detailed information at a price students could afford. There is so much misinformation on the internet and I wanted students to have the opportunity to learn good practices, rather than being told that vinegar is a useful mordant or that beetroot will give a reliable dye colour. In order to price the course within the reach of most people, I am not taking a fee, so the cost is only to cover expenses. I am lucky in that I shall have an assistant to do the heavy work, as I would not be physically able to teach the course otherwise. This course is something I have wanted to do for some time and the hope that it might actually happen has kept me positive during the difficult months since my illness, so I am really looking forward to starting in March. Ditchling Museum is a very special place with excellent facilities for natural dyeing and Ditchling has a rich natural dyeing heritage; Ethel Mairet lived and worked here and was living in Ditchling when her book Vegetable Dyes was published; also, natural dyeing and weaving courses are run at the museum by Jenny KilBride, the daughter of Valentine KilBride, one of the members of the Guild of St Joseph and St Dominic, who ran his weaving and dyeing workshop on Ditchling Common. 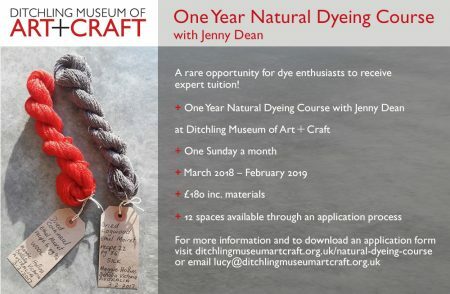 If you are interested in joining the course, whether you are a complete beginner or have some experience, visit the museum website or email lucy@ditchlingmuseumartcraft.org.uk for more details and an application form.